Harvard is committed to an energy efficiency-first strategy. 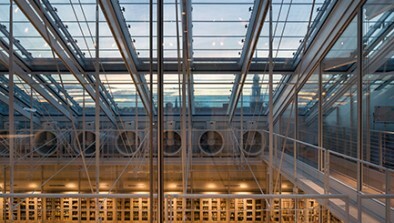 7,046 LEDs light 3.5 million books at Harvard Library, providing $18,000 annually in energy savings. Throughout the University, building managers and facility departments are saving money and cutting emissions by reducing the energy used by campus buildings. Increasingly, these teams are achieving deeper reductions by implementing innovative energy efficiency measures and undertaking on-going commissioning projects to optimize building performance. Ninety-seven percent of the University's emissions are from building electricity use, heating, and cooling. As a first step in meeting its 2006–2016 climate goal, Harvard focused on increasing the energy efficiency of more than 600 buildings. As a result, building energy use is down seven percent across the University, even as the campus grew (energy use varies year-to-year depending on weather conditions). Total campus energy use was reduced by ten percent in the same time period. Harvard’s campus includes more than 600 buildings making up 25 million square feet. This includes a dozen different types of buildings, the largest by square footage are residential, lab, and office spaces. While laboratory buildings only account for 22% of building area, they make up almost half of overall campus energy use. Lab buildings have also had an outsized impact when we look at the square footage added after 2006, labs make up 60% of the energy usage attributed to these buildings. From 2006–2016 Harvard’s campus square footage grew by 3 million square feet, a 12 percent increase. Although almost all space types have seen reductions, overall the total energy reductions were driven primarily by the lab spaces. From 2006-2016 Harvard’s energy use both increased, from the addition of new buildings and the conversion of existing square footage to more energy intensive spaces; and decreased, from a focused push to implement conservation measures in existing and new buildings. 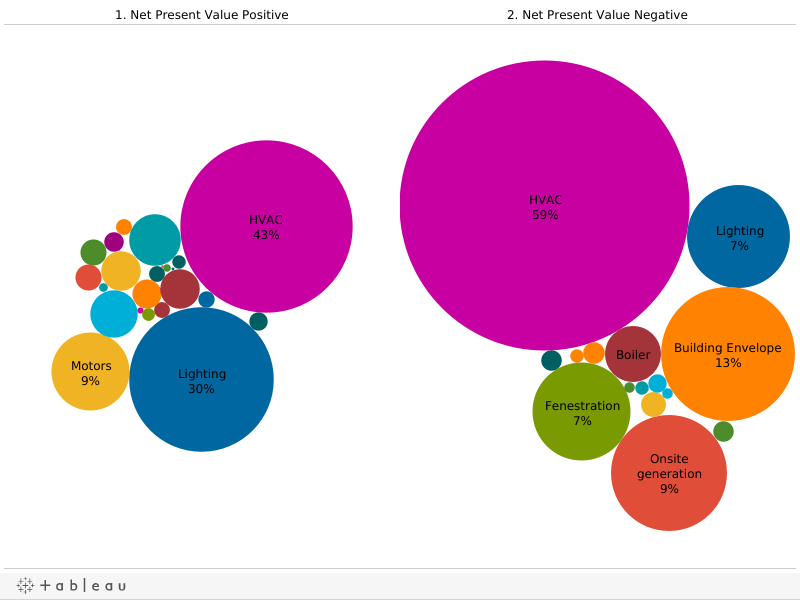 This chart shows the competing trends from campus growth (dark blue) and energy conservation projects in existing buildings (light blue). The cumulative energy use trend from new square footage has been a steady increase from 2006-2016. At the same time, energy conservation in existing buildings was driving big cumulative energy reductions. The result of these two competing trends is that for most of the years from 2006-2016 Harvard’s building energy trend was flat or slightly up. In 2016 the net measured building energy reduction was 7% below 2006 levels, including growth and not normalized for weather (2016 was a warmer than average winter). Both data sets are measured net reductions and additions, not normalized for weather or "business as usual” assumptions. 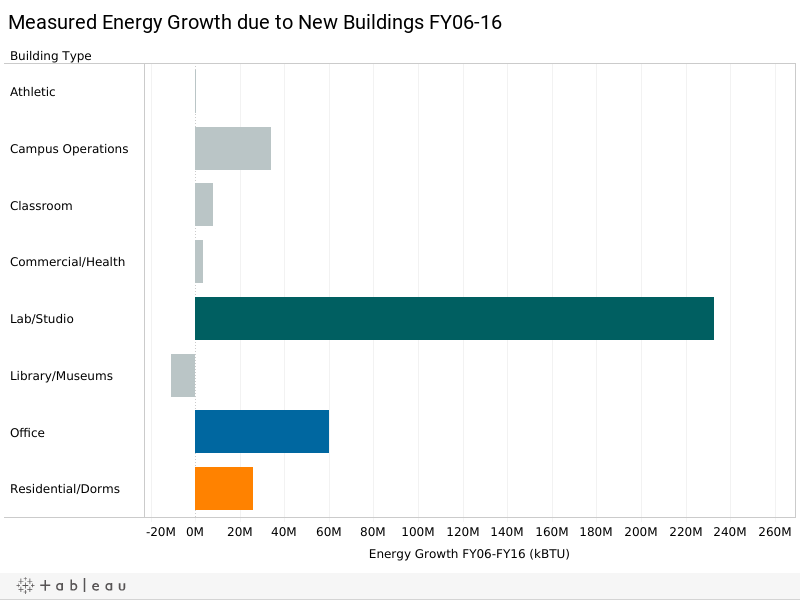 Increased usage from new buildings has been higher than reductions resulting from energy conservation in most years, with the exception of FY16 where reductions outweighed growth. 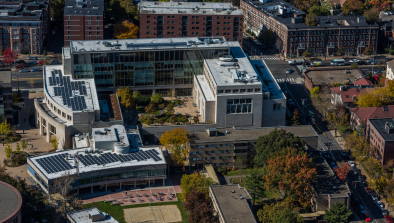 Since 2010, Harvard has had a commitment to conduct ASHRAE Level II energy audits on all energy intensive buildings. As a result of this commitment, more than 80% of the campus was energy audited, including all energy-intensive spaces. Energy reduction requirements were also incorporated into the five-year capital planning process. As part of this process, Harvard’s Schools report annually to the Office for Sustainability. OFS compiles and analyzes University-wide trends using this data to inform future strategy and policy-making. As part of the Climate Goal Implementation Plan, each of the Schools committed to implementing the energy conservation measures (ECMs) which were considered a good financial investment and also reduced greenhouse gas emissions. Through the energy audit process, Schools identified lists of potential projects, and Schools have been working to implement all logistically feasible projects that are net present value positive over 20 years so that they save money over the life of the equipment. As a result of these efforts, the Schools and Departments have implemented more than 1,000 net present value positive (NPV+) energy conservation measures with a cost of $27 million and a project payback ranging from one to 16 years. The most common types of improvements were HVAC (heating and cooling) and lighting upgrades. The cumulative annual savings for these projects is estimated at $14 million, with an estimated present value of lifetime savings of $165 million. These numbers are most certainly an underestimate as it considers only those projects formally reported to the University. We know there are many other energy conservation measures that were completed as part of capital projects, but were not tracked as separate ECMs or reported through the annual ECM reporting process. 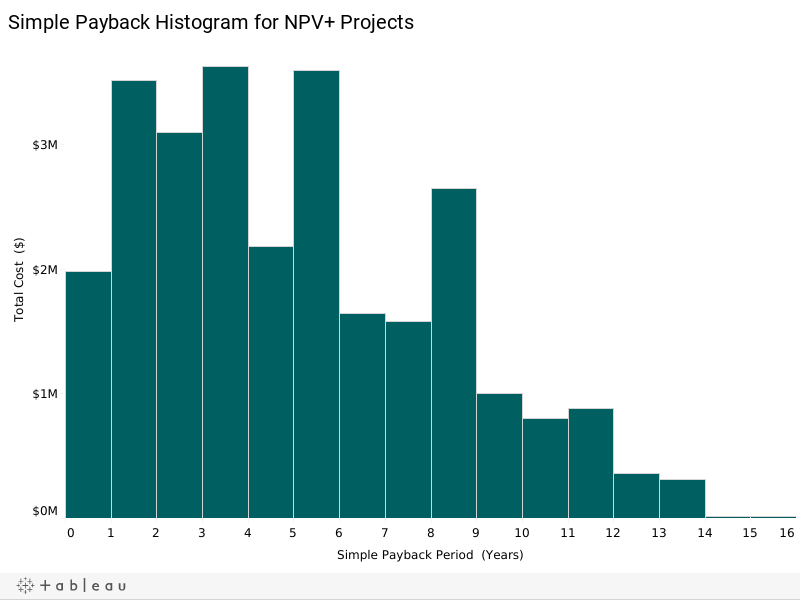 Additionally, these numbers include only those projects with accurate utility savings estimates; there are many more where the savings are uncertain, and these projects are necessarily excluded from the analysis. Through this process, schools also reported about 800 capital projects that were not NPV+, but did result in energy reduction in the buildings (such as roof and window replacements, major HVAC upgrades, boiler replacements). These projects are tracked separately since the timing of these major investments is driven by capital renewal needs, not by the energy savings alone. The Schools have been routinely using these capital projects as an opportunity to use the Life Cycle Cost calculator to identify the options that will have the highest lifetime savings and choosing to invest in energy saving options. Schools have invested $56 million in these NPV- projects, with a cumulative annual associated energy savings of $2 million, and a lifetime savings of $20 million. As part of the implementation efforts for the 2006–2016 Climate Goal the University set up standards and policies to align people around common priorities, while giving them the ability to adapt based on the local circumstances at an individual School or department. Green Building Standards: The Standards ensure all capital projects and renovations incorporate long-term costs into decision-making, and include aggressive energy efficiency targets. Harvard’s Green Building Standards require that major renovation projects achieve a minimum of 18% reduction below Massachusetts energy code. Life Cycle Cost Policy: The Policy, tailored to Harvard-specific utility rates and data, is used by all Schools to evaluate energy conservation projects based on cost-effectiveness and environmental benefit. Harvard's $12 million Green Revolving Fund provides access to capital to facilities departments for smart, cost-effective projects. The Fund allows projects with paybacks of 11 years or better, as well as innovative financing options for “soft” costs for project analysis, bundling of projects, and using the fund to finance just the incremental cost of a more efficient component of a larger capital project. The Fund has supported more than 200 projects, providing facilities departments with access to zero-interest capital for cost-effective energy and emissions reduction projects, including renewable energy installations. 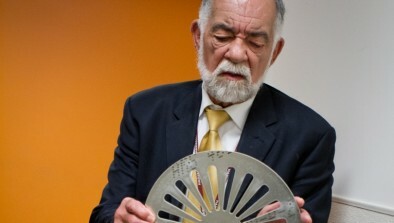 Schools also fund hundreds of other projects through other mechanisms.